All it needs is a card reader, better battery life and a price cut. The Lenovo Yoga 920 is yet another example of what Intel’s latest CPU generation can do for ultrabook performance. This slim, handsome convertible makes mincemeat of its predecessor, and it's among the speediest ultrabooks we've tested with an 8th-generation Intel CPU under its hood. But while we’re impressed by the Yoga 920’s looks and quad-core speed, it's pricey for what you get. Like its predecessor, the Yoga 910, the Yoga 920 is a gorgeous machine. Weighing in at a shade above three pounds, (3.02, to be exact, a tad lighter than the 910) and measuring a sleek 12.72 x 8.8 x 0.55 inches, the Yoga 920 feels pleasingly slim and trim. 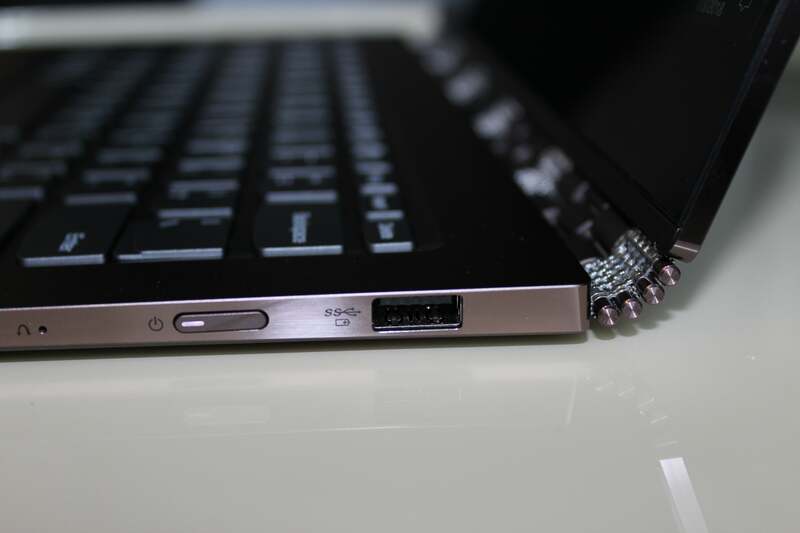 The luxurious watchband hinge from the earlier Yoga 910 makes a welcome return in the Yoga 920. 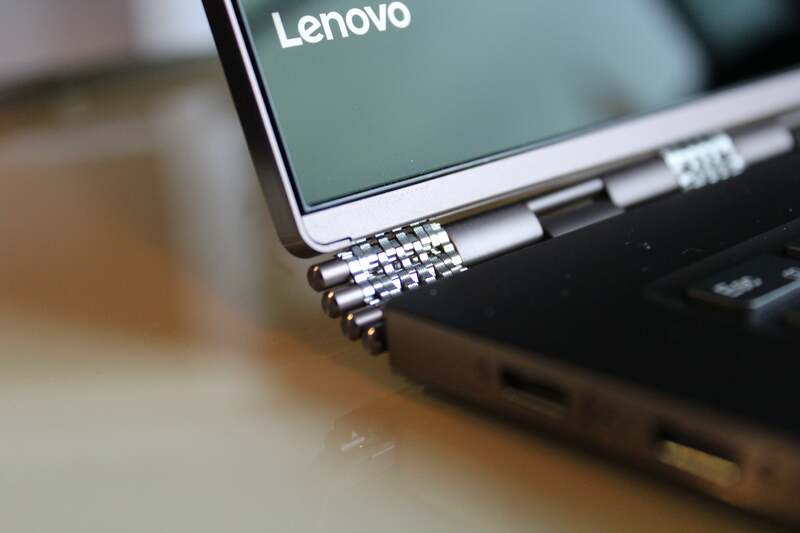 Besides its sleek, unfussy lines, the 2-in-1 Yoga boasts (as did its predecessor) an eye-catching watchband-style hinge, which lets you bend the display all the way around for tablet use or tent the laptop for tabletop presentations. The hinge itself is as sturdy as it is classy, holding the Yoga’s 13.3-inch display steady with a bare minimum of wobble. We tested the $1,350 configuration of the Yoga 920, which comes with a quad-core 8th-generation Intel Core i7-8550U processor, integrated Intel HD 620 graphics, 8GB of DDR4 2400 RAM, a 256GB solid-state hard drive, a 13.3-inch FHD (1920x1080) touch display, and Lenovo’s Bluetooth “Active” Pen (more on that in a moment). Not bad, but it's worth noting that the HP Spectre x360—a slim, 8th-gen CPU-packing convertible that we just called "easily the best convertible you can buy today"—boasts a similar configuration (including the same Core i7-8550U processor, 8GB of RAM, a pen-friendly touchscreen and a 256GB SSD) for just $1,099. Perhaps a price cut is in order. Now, you can always shave $150 off the Yoga 920's price by downgrading to a Core i5-8250U CPU and losing the pen. On the other hand, you can spend as much as $2,049 by doubling the RAM to 16GB, upping the SSD storage to 1TB, and swapping in a UHD (3840x2160) display. The Yoga 920’s 13.3-inch IPS display is a pleasure to look at, what with its 5mm bezels on the tops and sides and its solid viewing angles. The nearly inch-thick bezel along the bottom of the screen, a holdover from the Yoga 910, a still a bit of a bummer. The good news is that Lenovo has moved the Yoga 920’s 720p webcam from the thicker bottom bezel, where it sat on the older 910 model, to a more conventional position above the display, a change that Skype users should appreciate. The Yoga 920's 13.3-inch touch display features an ultra-thin bezel, with the webcam now sitting above the screen rather than below. Detailed and sharp though it may be, the Yoga 920’s display isn’t the brightest we’ve ever seen. Cranking the laptop’s brightness setting all the way up got us to about 260 nits (or calendas), only slightly above the 250 nits we consider adequate for indoor viewing. That means viewing the Yoga 920’s display outside might require some squinting, especially given its glossy finish. 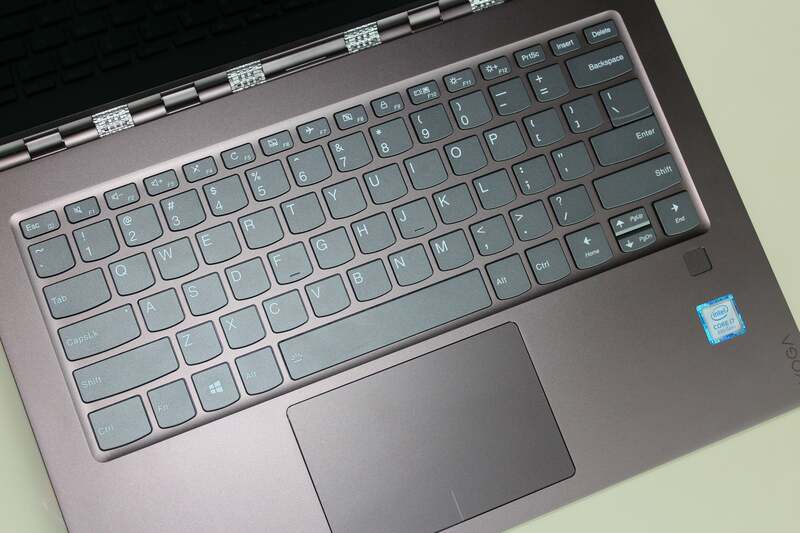 Lenovo restored the Yoga 920's right Shift key to normal size. Also, note the fingerprint reader to the right of the trackpad. The keyboard boasts a small collection of extra hotkeys that enable airplane mode, toggle the microphone, camera and touchpad on and off, lock the screen, refresh the desktop or the active window, and control external displays. Missing from the lineup: settings, search and menu. To the right of the Yoga 920’s smooth, responsive trackpad sits a fingerprint reader, which lets you unlock your Windows profile and log into Windows Hello-supported apps. The Yoga 920’s built-in JBL speakers are reasonably loud and clear as far as laptop speakers go—no bass to speak of (as usual), but a fair amount of mid-range detail and no noticeable distortion with the sound cranked all the way up. Personally, though, I was more interested in the Yoga’s support for Dolby Atmos, an audio format designed to envelop you in sound. You’ll need to plug in headphones to get the Dolby Atmos effect, which you can trigger and adjust using the Yoga’s Lenovo Vantage app. So, how does Dolby Atmos sound on the Yoga 920? Roomy and refreshingly non-gimmicky, if you ask me (although I admit, I’m no audiophile), with music floating around my head in an impressively realistic fashion. Indeed, I wrote much of this review while cranking my classical collection in Dolby Atmos courtesy of the Yoga 920, and I'll miss it when it's gone. Another extra worth mentioning is the Yoga 920’s array of four “far-field” microphones, which allow Cortana, Microsoft’s digital assistant, to hear you from across the room. Lenovo claims that Cortana will be able to hear your voice commands from up to 16 feet away. In my own tests, I was able to get answers from Cortana while standing about 25 feet away, without having to raise my voice. Not bad. Last but not least, Lenovo’s Active Pen 2, which comes complete with more than 4,000 levels of pressure sensitivity, is available as a $50 accessory to the Yoga 920. While I can’t vouch for each individual level of sensitivity on the Active Pen 2, I did enjoy doodling with it within the Windows Ink Workspace, a series of pen-friendly apps that sits in the Windows 10 toolbar. We previously complained about the Yoga 910’s lack of Thunderbolt 3 ports, but Lenovo made up for it this time by fitting a pair of powered Thunderbolt 3 ports on the Yoga 920’s left edge, just to the left of the headphone jack. The Yoga 920 boasts a pair of Thunderbolt 3 ports on its left edge. That’s the good news. 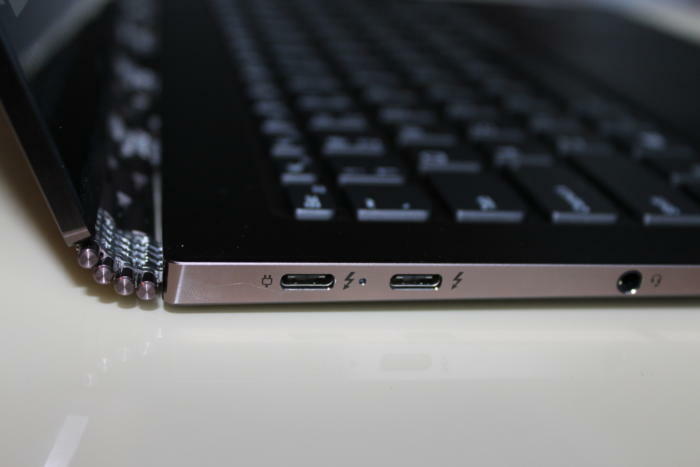 The bad news: besides a single USB 3.0 Type A port, that’s all you get in the way of ports. The lack of HDMI or additional USB 3.0 ports on an ultraportable as thin as this is understandable, but we’re particularly bummed that there’s no card reader. The HP Spectre x360, for example, managed to squeeze in a MicroSD card reader, while the svelte, Kaby Lake Refresh-powered Dell XPS 13 (a laptop-only system, mind you) packs a full-on SD card reader. Um, where's the SD card reader? The previous model in Lenovo’s Yoga 900 series—the Yoga 910—was no slouch when it came to performance, but the slim and trim convertible had to settle for a dual-core CPU, given that a quad-core Kaby Lake chip would have melted the 910’s razor-thin chassis. But that was then, and Kaby Lake Refresh is now. Capable of delivering quad-core performance within an ultrabook shell, Intel's 8th-generation Kaby Lake Refresh CPUs are game-changer as far as ultraportables go, and the Yoga 920 doesn't squander the opportunity. 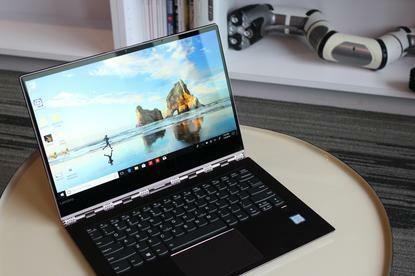 Given its quad-core, 8th-gen i7 CPU, we didn’t really expect the Yoga 920 to have any trouble with the Microsoft Office suite or general, day-to-day desktop duties, but we ran the laptop through Futuremark’s PCMark 8 Work Conventional benchmark just to be sure. A score of 2,000 or higher usually means a given system can run Office with nary a hiccup. 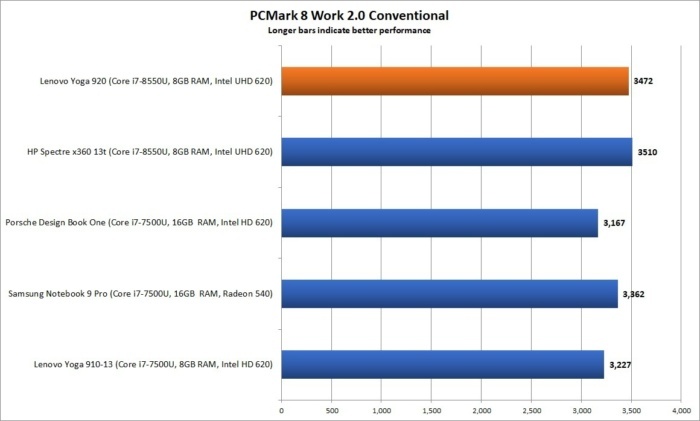 PCMark 8 Work Conventional shows that for mainstream applications, dual-core vs. quad-core CPUs don't matter much. With its stellar mark of 3,472, the Yoga 920 makes the grade with plenty of room to spare. 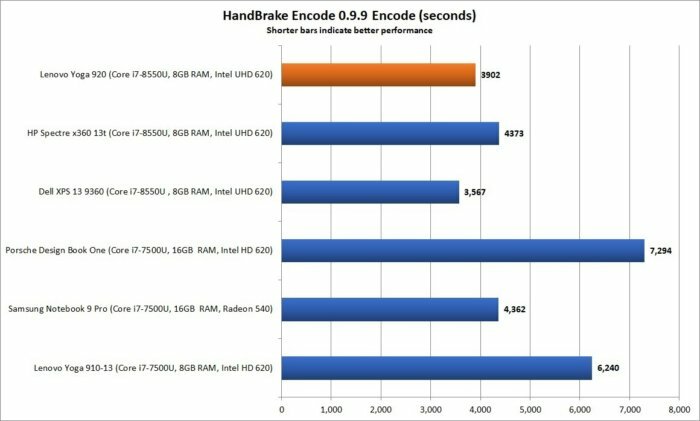 No surprise there, but it’s worth noting that the the 920’s PCMark 8 score isn’t much better than that recent dual-core laptops we’ve tested. In other words, laptop users who use their machines purely for Office could easily stick with a dual-core CPU, and a quad-core system could be overkill. The real test of a quad-core notebook like the Yoga 920 is how it handles processor-intensive chores—in this case, converting a 30GB MKV file into a smaller MP4 file using the popular Handbrake utility. It’s a test that spikes CPU speeds, heats up the chassis and gets cooling fans roaring (temporarily, if everything's running smoothly). The HandBrake file conversion test shows the clear difference between the 8th-gen quad-core CPUs and 7th-gen dual-core CPUs. Only the Samsung Notebook 9 Pro's discrete GPU helps it keep up with its quad-core competitors. With its score of just a shade under 3,500, the Yoga 920 turns in a blisteringly fast result, beating the pants off its dual-core competitors and even edging Dell’s quad-core XPS 13 revamp from late last year. Impressive, especially considering that the Yoga’s razor-thin 2-in-1 design. Another rigorous test for quad-core laptops is our Cinebench R15 benchmarks, which measures how quickly a system can render a 3D image. Cinebench (longer bars indicate better performance) taxes the CPU and shows a slight advantage for the Dell XPS 13 compared to the Lenovo Yoga 920, likely because of thermal throttling. We generally expect quad-core laptops to shine in this test, and the Yoga 920 didn’t disappoint, just outstripping the recent HP Spectre x360 (another 8th-generation Core i7 powerhouse). 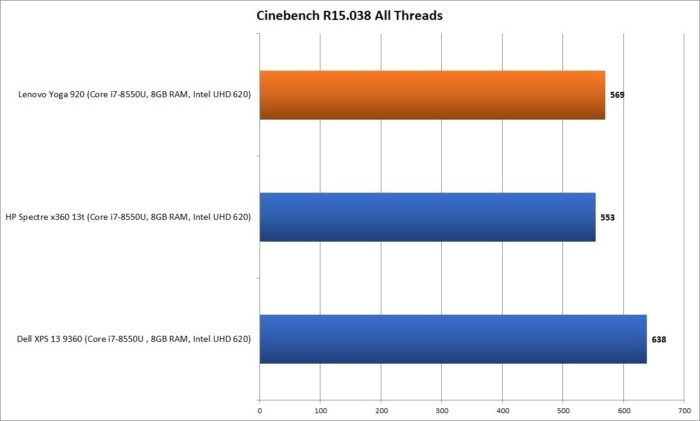 The Yoga 920’s Cinebench score falls a tad short of the Dell XPS 13’s, probably because the Yoga taps its breaks to prevent overheating. Perhaps needless to say, the Yoga 920 leaves it dual-core Yoga 910 predecessor in the dust. While the Yoga 920’s 8th-generation quad-core i7 CPU works wonders within the laptops slim convertible shell, the system’s integrated Intel HD 620 Graphics core delivers only ho-hum performance. 3dMark Sky Diver is a GPU test that shows the Lenovo Yoga 920 running in the pack with Intel HD/UHD 620-equipped laptops. The Samsung Notebook 9 Pro stands out with its Radeon 540 graphics. 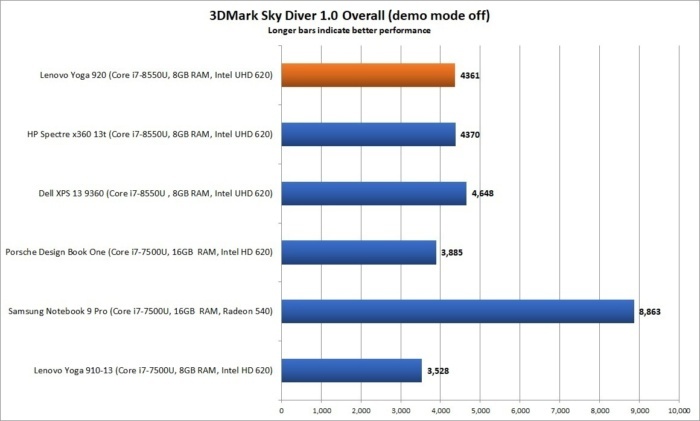 The Yoga 920’s 3DMark Sky Diver results are pretty much on par with its current class of ultrabook competitors. For a true gaming laptop, you’ll have to pony up for a machine with a discrete graphics core, like the (heftier) Samsung Notebook 9 Pro. To test the battery life of a laptop, we loop a 4K video using the built-in Windows 10 Movies & TV app with the sound on and the screen brightness tuned to about 250 nits. The Lenovo Yoga 920 has a larger battery but a slightly shorter battery life compared to peers. The Yoga 920’s result: about 625 minutes, or a little more than 10.5 hours. That sounds pretty good at first blush, and it’s a score that’s roughly similar to that of the earlier Yoga 910. 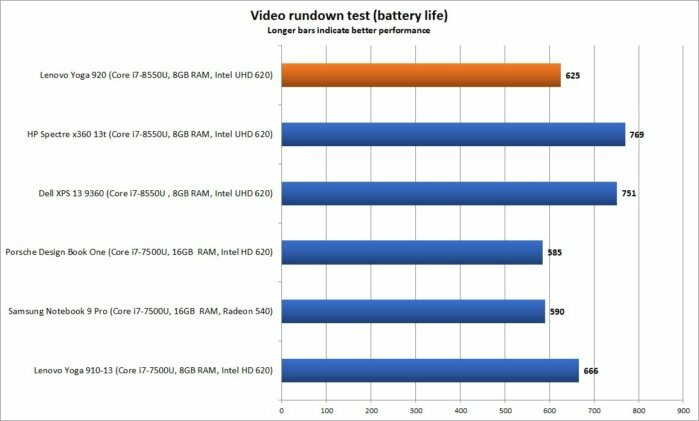 But our Yoga 920 battery drain results fall somewhat short of what the HP Spectre x360 and the Dell XPS 13 achieve, each of which packs in a smaller battery (60WHr) than does the Yoga (70WHr). What gives? Laptop battery life is complicated to dissect, because there are more interdependencies. The Yoga 920’s HandBrake test indicated some thermal throttling, but not to a debilitating degree. The touch-enabled display could be partially to blame. However, the HP Spectre x360 has a touch display, too, and both the Yoga and Spectre are 2-in-1s, a tricky design when it comes to dealing with thermals.